← The Lazarus Experiment – now an Android App! Readers to the blog will recall that late last year I read a book called The Devil in the White City by Erik Larson, a non-fiction, brilliantly vivid account of the Chicago World Fair 1893 and the exploits of a serial killer in the shadows of the festivities. The use of the principle figures own words and documentation to tell the story in such a narrative manner brought the period alive for me and hooked me on the story of this magnificent and brutal American city. ‘Sin in the Second City: Madams, Ministers, Playboys and the Battle for America’s Soul’ by Karen Abbott is, amongst being a rather wordy title, another look into the Windy City’s very soul and picks up almost immediately after Erik Larsons book finishes. Indeed both books are published by the same company (Random House) and there is a little overlap in that Larson refers vaguely to the ‘disappeared’ women who travel from far and wide to Chicago in search of a better life. Karen Abbotts book picks up the tale of the disappeared and tackles the issues of ‘white slavery’, police and civic corruption and a nation wrestling with its own morals. Much like the Devil, Sin is written exclusively from the testimony of people of the time, newspaper and county records and other recorded evidence. It is a marvellous feat in informative storytelling, and I do wish that all history books were written like this because the take up in colleges of History would be so much the higher. The language is never too dense, though it liberally sprays colloquialisms from the time which using the Kindle dictionary I was able to look up if I needed to. A very professionally laid out hyperlinked contents page, breaking the story up into vignettes that can last from two page turns to 20 page turns lends a certain momentum to the plot. You can put it down at any moment given the opportunities for a break, but its very lay out makes you want to keep pushing on. Once again Random House have included a wealth of original photography in the Kindle edition, maximising the potential of the format and providing a reading experience that is a real pleasure. The figures at the heart of the story – the upstart madams known as the Everleigh Sisters, bitter and vengeful former Queen of the Levee Vic Shaw, Zoe Millard, Bathhouse John Coughlin, Hinky Dink Kenna, Ike Bloom, the Weiss brothers, Big Jim Colosimo (predecessor to Al Capone), Ernest Bell, Clifford Roe, Mayor Carter Harrison II (his father having featured prominently in Larsons book as mayor) – all loom larger than life. The portrait photographs of the notorious and grand, and the notoriously grand, alongside descriptions of their personality and quotes from their own lips provide intimate insights into real people living extraordinary lives. It almost seems impossible to believe now, but the Levee district, being the designated segregated area for prostitution, gambling and drugs with the full endorsement of politicians and police at the turn of the 20th Century feels like a part of the fabric of life. At times you could almost be forgiven for agreeing with the principles that a ‘segregated’ area was better than driving it underground such is how well Karen Abbott draws the personalities of the people involved. The central narrative line for Karen Abbotts work is this issue of White Slavery – innocent white American girls being tempted or forced into coming to Chicago to work in the vice trade and being unable to leave it until their ‘debt’ is paid. This was a toxic topic for politicians (who received much of their electoral money and votes from the vice district leaders) and reformers at the start of the 20th Century. They could accept foreigners working the vice trade but not the idea that the wholesome young American woman was being corrupted and coerced into a (very short, according to the reformers) life of sin. Still, the topic was a bit of a taboo and religious ministers and lawyers spent considerable time looking for that one story that could blow the whole issue up into a national crisis. 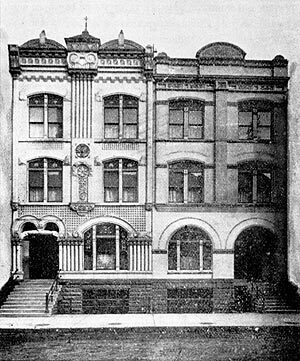 Into this tension come Minna and Ada Everleigh who open arguably the most famous(They were referenced recently on an episode of crime drama The Chicago Code) brothel in the history of the United States – the Everleigh Club at 2131-2133 South Dearborn Street. Naturally a target for reformers, they also alienated their fellow madams with their attempt to elevate the oldest profession in the world to some kind of classy respectable level. No drug abuse here, no stealing from the punters either. The Everleigh sisters ‘butterflies’ as they called their working girls were educated in order to hold their own in conversation with the leading men of the city, who after spending some hours listening to the ‘professor’ on the golden piano and enjoying the glorious Pullman Buffet in one of the themed rooms would then retire upstairs with one of the girls of their choosing. It wasn’t so much an act the Everleigh sisters were selling but an experience. And those ‘butterflies’ could earn more in one night at the Club than in a week at other brothels. Minna and Ada had to fight against the jealousy of their fellow madams, play the game of greasing the wheel of local politics and smile sweetly in the face of ranting preachers foreseeing fire and brimstone for the women. Do the Everleigh sisters succeed in transforming the perception of prostitution? Do they be able to counter the attacks by fellow Madams, preachers and politicians alike? What is the ultimate destiny of the thousands of people working and living in the Levee? Download a sample from the kindle store, and I am sure you will purchase the full ebook (which isnt cheap but is worth every penny). It is as thrilling and unpredictable as the best fiction, and every word spoken, every major action taken… really happened, down there, in rooms like the Japanese Throne Room of 2131-2133 South Dearborn Street, Americas most famous brothel. Did you know? The expression “I’m going to get laid” according to Karen Abbott can be traced back to South Dearborn Street. She believes it to be a corruption of “I’m going to get Everleighed”. That’s how famous Minna and Adas venture became – it won a permanent place in the English language. Next: Having read up on 50 years of Chicagos history now, I am itching to get a book in the same style on the life of Al Capone which should link via Big Jim Colosimo to the items I’ve already read. The Japanese Throne room was just one of many themed rooms including the famous Pullman Buffet.